On Friday September 7, the South Parkland FASD Coalition hosted “Lunch with Bev”. About 20 people attended this brown bag luncheon (participants brought their own lunch). Participants included a mix of professional and community members. It was held in a comfortable, informal space at the Dauphin Friendship Centre. Twyla Gilroy, the coalition chair, welcomed all who attended, and acknowledged the traditional lands where we were meeting. 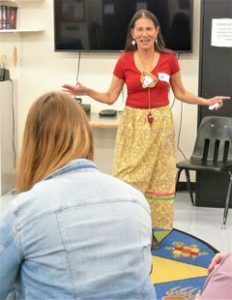 Bev, a local elder, shared her story about her life experiences, consisting of the good times and the not so good times. Her personal story of tragedy and triumph, trauma and loving relationships, addictions and sobriety, and shame and dignity touched the hearts of everyone in the room. Her strength, resiliency, and positive outlook on life moved us all. Bev’s story challenged us to rethink how we think about FASD and the mothers of children with FASD. As she shared her story, we were able to see the context of the social factors of her life in a new light, and achieved greater understanding of the complexity of FASD. Bev responded to questions and comments from those in the room. A common theme of discussion was a greater understanding of and respect for women who use alcohol and other substances during pregnancy. We all left the lunch encouraged to continue to support women with whom we interact. Everyone left with a cookie (or two) provided by coalition members. Each cookie had a sticker with the Looking After Each Other logo and website address. Several lucky attendees also went home with door prizes. The South Parkland FASD Coalition was happy to host this successful event of bringing awareness and education about Fetal Alcohol Spectrum Disorder to the south Parkland. We envision that events such as this will promote dignity related to FASD.